A ward is something that protects or defends, and when placed around a home it works like a barrier, preventing negativity from entering. However, you have to check on this regularly, just like a wall used to defend a city. How often you need to refresh your ward is completely dependant on your neighborhood and the sort of things following you home. I live in a nice little neighborhood, but right down the street is a not so nice one. Last December my car was stolen from our driveway while I was home by some kids that lived down the road. That being said, my ward needs refreshing rather often. Two to four times a year is usually good, but just remember to keep an eye on it. If you notice it needs refreshing, take down the old ward and reconstruct it. 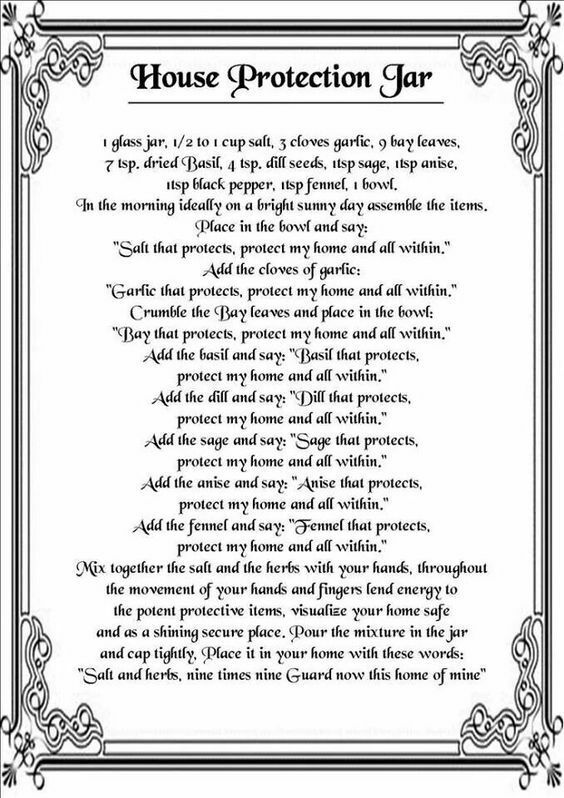 My favorite ward ritual also comes from The Way of the Hedgewitch by Arin Murphy-Hiscock. Like her threshold protection spell, its easy, quick, and informal. Repeat this over and over until you have walked completely around your home. Next pick up the dish of earth. Again, walk around your home sprinkling dirt as you go. Guard this home against all ill will and danger. Keep this house and those who live in it safe. And there you have it, a home protection ward! Now sometimes a ward needs to be dissolved. These times would be to refresh a ward, if you move, or if there are major changes that occur in your life or the life of the house, i.e. career change and remodeling. You have my thanks for your protection in the past. A little word of warning about wards and protection barriers. If you are keeping something out you are also keeping something in. It is in your best interest to dissolve your barriers once in a while to let out any trapped energy. “I neutralize the power of [name of your adversary] to do me any harm. Roll up the parchment, tie it with black thread to bind it, and place it in the bottle. Fill the bottle with the dry ingredients. Then take the white candle and, while turning the bottle counter clockwise, drip wax over the cork to seal it. Last, secretly bury the bottle in a place where it will not be disturbed and no animal or person will dig it up. It should never be opened or the power of the spell is lost. On Full Moon night, take a cleansing bathe and robe yourself in white. Carry a good protective or purification incense through every room in the house. Make certain that the smoke drifts into closets. By the power of the rising sun, all evil in my life is done. By the power of darkening night, my shield is strong, my armor tight. By Full Moon in blackening sky, I am not alone. My help is nigh. The Goddess’s hands around me stay, To keep me safe by night and day. Begone, foul spirits, unbidden here. I send you back, I do not fear. For I have won. I am set free. You have no further power over me. Thank the Powers for their help and extinguish the candles. Apply the oil and repeat the chants whenever you feel the armor is slipping. Cast a circle and light the candle. Sprinkle the caraway on the candle’s flame (be careful!) and on the mirror. Close your eyes and imagine yourself surrounded by a magic shield… imagine the negative energies bouncing off your shield and returning to where they came from. Stop the flow of negative energy in my direction! Now turn East and repeat the words for Air. Repeat for Fire and Water. Close the Circle. Place the red pepper inside your right shoe to prevent foot track spells from being able to latch on to you. Drill a hole into the silver dime and string it with the leather throng. Wearing this amulet will protect you from others attempting to Hoodoo you. Place the horseshoe over top your front door to keep evil forces from entering the home. Tub Run a bath sprinkling in ground cinnamon. Make sure to fully submerge yourself to wash away any negative influences that may have attached themselves to you. Using a pen, in the center of the oil-drawn pentagram, draw your own special symbol for protection. and protect myself with the power I have. Continue doing this with the smoke of the white candle, but consecrate it in the name of air. Hold the charm with both hands. Concentrate on the charm’s task. Then seal the left end of the charm with white wax, the right with red wax. The charm is now complete.